Shopping Cart System store and site builder is an e-commerce or web site solution software for creating Web Store to be posted on the Internet. 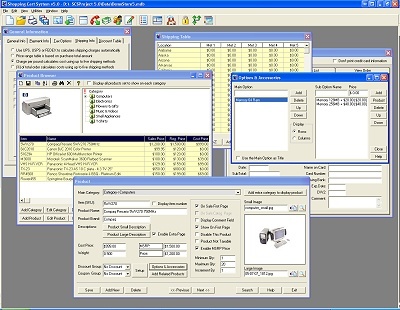 The purpose of this store builder is to provide an easy-to-use interface that automatic creates all the HTML files necessary to run your store. Any currency, Built-in search engine, Build unlimited number of stores, E-mail receipt sent to customer, FTP Built in to transfer your files and more. ecommerce shopping cart to create manage and effectively market your store. This Ecommerce Shopping Cart software creates and manages your Online Store. Qweas is providing links to Shopping Cart System 6.0 as a courtesy, and makes no representations regarding Shopping Cart System or any other applications or any information related thereto. Any questions, complaints or claims regarding this application Shopping Cart System 6.0 must be directed to the appropriate software vendor. You may click the publisher link of Shopping Cart System on the top of this page to get more details about the vendor.